Prominent & Leading Manufacturer from Coimbatore, we offer inclined screw conveyor, mild steel screw conveyors, horizontal screw conveyor, pipe type screw conveyor, screw conveyor and two way screw conveyor. We are one of the eminent manufacturers of wide range of Inclined Screw Conveyor to our valued patrons. 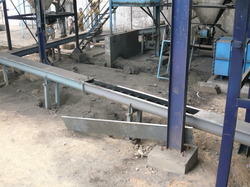 These conveyors are highly used in various industries. These products are extensively used for transporting crushed material from one place to another. The entire range is fabricated using premium quality raw material and sophisticated technology by our skilled professionals. We are the leading manufacturer and supplier of Inclined Screw Conveyor in Tamilnadu, Kerala, Coimbatore, Tirupur, Karur, Salem, Chennai etc. Made from superior grade steel, these Mild Steel Screw Conveyors are offered at competitive rates. A Mild Steel Screw Conveyors is basically a material handling mechanism, which is used in many bulk handling industries. It is reckoned in the industry for features like durable finish standards, high performance, sturdy construction and efficiency. We are the leading manufacturer and supplier of Mild Steel Screw Conveyors in Tamilnadu, Kerala, Coimbatore, Tirupur, Karur, Salem, Chennai etc. 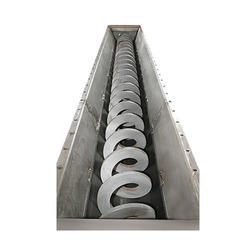 Being a dominating manufacturer of industry, we are involved in offering a varied range of Horizontal Screw Conveyor. They are manufactured using high-grade basic material and are in compliance with defined industry standards. These find wide applications in cement, fertilizer, sugar and other process industries. These products are fabricated from superior grade materials and components at the modern production plants of our vendors. We are the leading manufacturer and supplier of Horizontal Screw Conveyor in Tamilnadu, Kerala, Coimbatore, Tirupur, Karur, Salem, Chennai etc. Customers can avail from us a wide range of Pipe Type Screw Conveyor at pocket-friendly rates. The function of screw conveyor parts depends on the size of the pitch of flight. These are manufactured by the professionals using high-quality raw material and advanced technology. The product is designed to handle bulk and a wide range of material with ease. We are the leading manufacturer and supplier of Pipe Type Screw Conveyor in Tamilnadu, Kerala, Coimbatore, Tirupur, Karur, Salem, Chennai etc. Our organization is authorized for offering our valuable clients a wide gamut of Screw Conveyor. 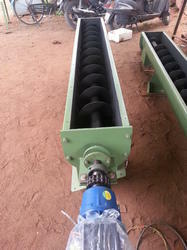 These conveyors are offered to the customers at highly competitive rates. In order to ensure optimum client-satisfaction, we manufactured the offered products as per their specifications. Offered conveyors are designed from the optimum quality raw material in adherence to the international quality norms. We are the leading manufacturer and supplier of Screw Conveyor in Tamilnadu, Kerala, Coimbatore, Tirupur, Karur, Salem, Chennai etc. We have established our self as a renowned firm engaged in manufacturing a wide array of Two-Way Screw Conveyor. Following all the quality guidelines set by the industry, this range is made using qualitative raw-material and latest technologies. The product is designed to handle bulk and a wide range of material with ease. We are the leading manufacturer and supplier of Two-Way Screw Conveyor in Tamilnadu, Kerala, Coimbatore, Tirupur, Karur, Salem, Chennai etc.